Sega Toys Japan is pretty active when it comes to developing toy robots. They are the company behind the E.M.A. (aka the kissing robot) or the A.M.P. (aka the music robot). But Sega Toys is also selling a lot of animal robots, for example a robo-hamster, baby biddies or a puppy. Their newest robotic animal is called Dream Cat Venus [JP, PDF]. 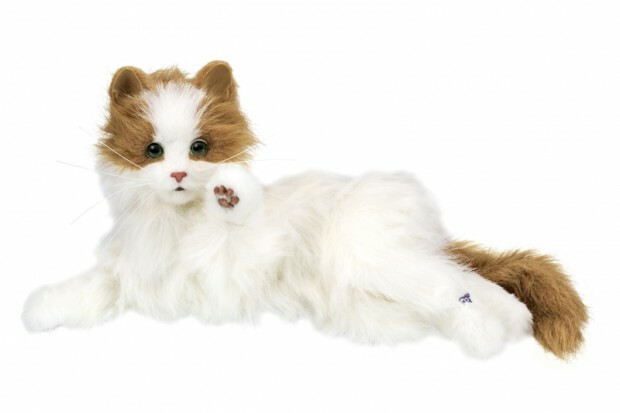 Sega Toys has been selling life-like (well, almost) robo-cats in Japan for about 3 years now. And Venus (designed like a Norwegian Forest Cat) is an upgrade for an older model called “Smile”. Sega Toys says it’s the right choice for people with no time to look after a real animal. I’ve seen the older model in action quite a few times. And these things are really pretty realistic. Venus can move around, lay down and reacts when you touch it. There is a photo sensor in the forehead and several touch sensors are installed in the body. Sega Toys worked together with scientists from Tohoku University‘s Institute of Development, Aging and Cancer in Northern Japan to make sure Venus reacts realistically when you touch or speak to it. Say “There, there” (in Japanese) and it will purr, for example. The battery-powered robo cat is sized at 490×240×230mm and drops into Japanese stores July 30 (price: $110). And you even get a comb with it. Ask spezialised stores Japan Trend Shop, Geek Stuff 4 U or Rinkya to get one shipped outside Japan if you can’t wait for Sega Toys’ international distribution plans.